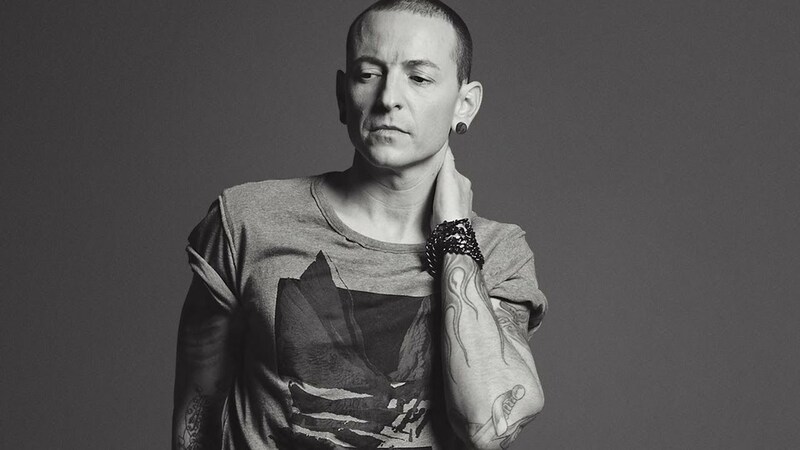 It’s been one year since the world lost the lead singer of Linkin Park, Chester Bennington. His death indirectly affected me a lot more than I ever expected. I’ve never been overly interested in celebrities, and when news of a celebrity death by any means occurred, it rarely upset me. Unless it was someone I enjoyed watching/listening to. But even then, I would just think, “yea, that’s sad, too bad for the families” and go on with my life. Their death didn’t affect me personally. 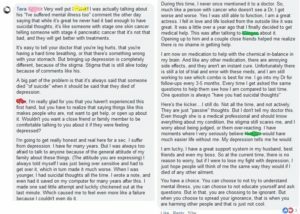 I’ve heard about many celebrity suicides and overdoses during my battle with depression. These always made me stop and think about them at least a little bit. Most often when it was a fellow fashion designer, such as the recent passing of Kate Spade. I also still very much remember learning of legendary fashion designer, Alexander McQueen’s death years ago. Whenever I was to hear about these suicides, I knew what to expect. An outpouring of support for people suffering from depression, the media and people of Facebook sharing the suicide hotline number, and reminding the world that it can happen to anybody, and that money truly cannot buy happiness. And then a week or so later, everything would be back to normal. 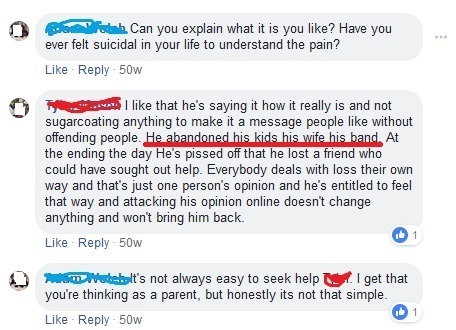 Don’t get me wrong, I appreciate the sentiment behind what people are trying to do when they share the suicide hotline, but at the same time, it can feel insincere. Mainly because it seems “trendy” to share the hotline on Facebook with an easy copy/paste anytime someone high profile dies by suicide. I have seen some people posting after a suicide that they are available if any of their Facebook friends need someone to talk to. I like this, but it’s starting to become trendy as well, but the fact that the person is willing to do more than just a copy/paste post, is nice to see. Although I have never taken anyone up on these offers. Not everyone is going to feel comfortable messaging someone after seeing that post, but it’s nice to know people are willing to help. So this brings us to July 20th 2017. That day, the lead singer of Linkin Park, Chester Bennington passed away from suicide. I found out about it at the end of the day. I came home from work and saw it posted all over Facebook. It was a big deal for sure. But like with other celebrity deaths, I thought “that’s horrible” but didn’t put much more thought into it. The days that followed, many posts and articles were shared relating to his death and the reactions to it. I read a lot of them, mostly from The Mighty. 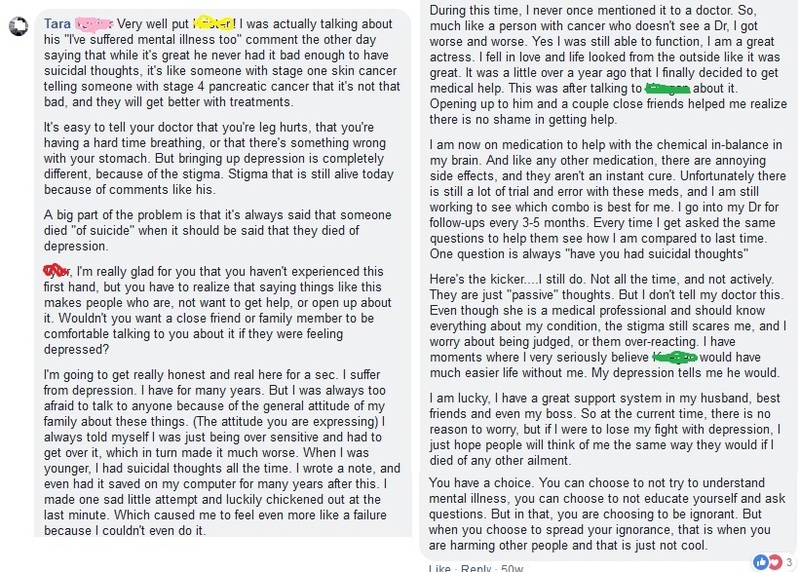 I read a lot on the topics of anxiety and depression on The Mighty, and I do share the occasional post on Facebook. Before this, I shared the odd post, and never specifically wrote anything about myself in the share. I had never talked about my struggles with depression and anxiety publicly on Facebook at this point, and I was still very hush hush about it. 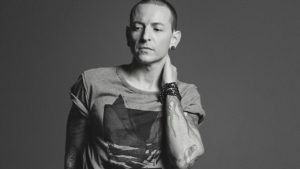 I found a post titled “What We Can Learn From Brian Welch’s Infuriating Response to Chester Bennington’s Suicide” I read it, and I thought that the points it made were worth sharing. I didn’t realize it at the time, but sharing this post was the catalyst to a major change in my life. 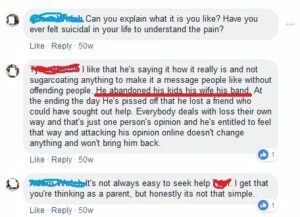 But before I get into that, I just want to share the brief points this article made about what we can learn from insensitive comments about suicide. The article really expands on each of these points, and I highly recommend reading it. 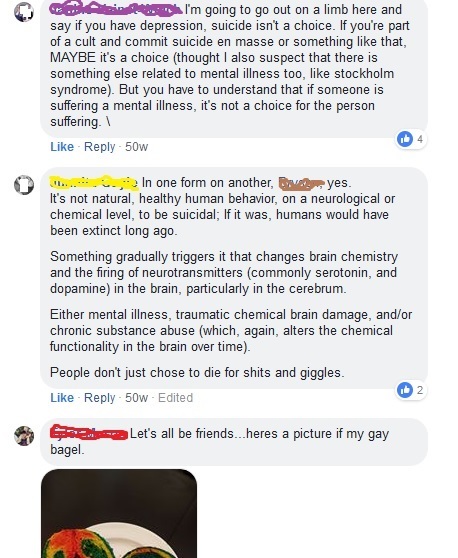 So, I shared it, hoping it can educate a few people on my friends list who choose to read it. Unfortunately, people who don’t read it, are still able to comment on the post, and that is where the problems started. One person, I am going to call “Red,” said that they liked what he said. And a friend “Blue” asked for an explanation, and what Red answered with really upset me. I wanted to highlight certain points from the article that I thought would be impossible to argue with. But he completely missed the points, and I assume he just skimmed my comment. All he seemed to take from that was that we were trying to force him to agree with us, but we just wanted him to hear us. My friend “Yellow” who is a nurse began getting involved. She and Red know each other and don’t have the best past. 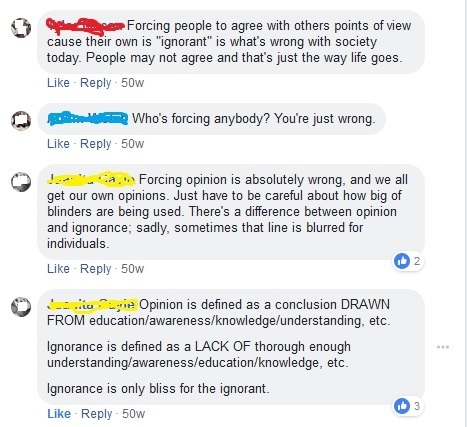 She is very smart and tried to explain the difference between “opinion” and “ignorance” to him. 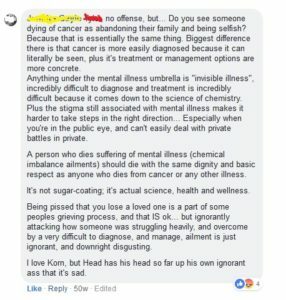 Then continues to educate him about mental illness and how it should be treated like any other illness. I was very impressed with her explanation, and said so in my response. At this point, I decided to do something I never thought I would do. I opened up, publicly, about my struggle with depression and suicide. I sat and thought about whether I should say this for a long time, I re-wrote that comment over and over again. Then when it came time to hit the button, it took a few moments because I kept worrying about who all might see it, and find out. But then I realized, that is just as bad for allowing the stigma to stick around. 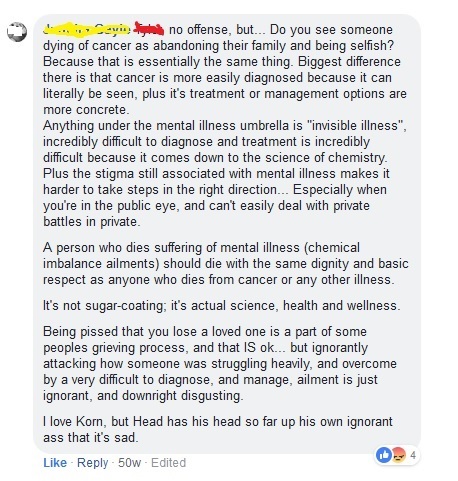 People aren’t worried about being judged for having cancer, diabetes, or asthma. Why should I worry about being judged for this? 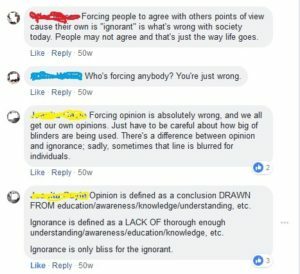 After posting this, Red didn’t respond, and Yellow commented with an image that said “Facebook comment of the year” so I felt good. But then, out of nowhere, my brother-in-law “Brown” who is very good friends with Red decided it was time to chime in. ….I was speechless. I couldn’t believe it. The comment about the longer messages on here really baffled me. 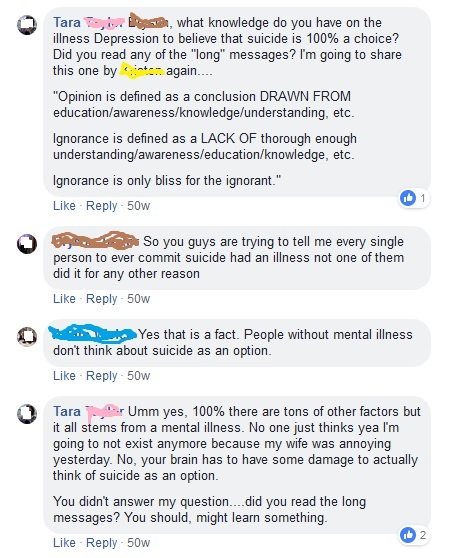 Then, without answering my questions, goes on to try and say that not every suicide is caused by depression. Which, I know I said they all are in this thread, maybe a couple aren’t, who knows, but that’s not the topic at hand. 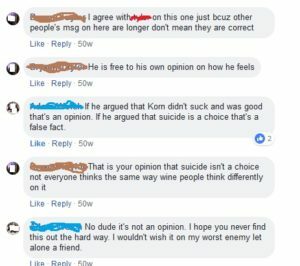 This is about the fact that Chester Bennington had depression, and Red and Brown believe he is a coward who abandoned his family and feel that a high profile person with a lot of influence is ok to just make those comments publicly. I was at work when Brown began to chime in. During this back and forth, I began to feel so defeated. I was having a hard time concentrating and had to try really hard not to break out in tears when I had to interact with clients occasionally. And for the first time in years, I began having suicidal thoughts. My best friend, “Purple” joined in, which I was hoping she wouldn’t, as she had been having a hard time with her depression that week, and I didn’t want these guys to cause her any harm. 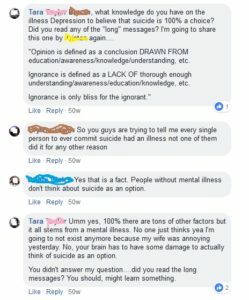 But she made a good point to answer Brown’s question about if all suicides are from depression. Yellow also gives her input. Then, Red comes back. He derailed the conversation with a picture of a rainbow bagel that he referred to as a “gay bagel” for some reason. He and Brown never read any of my comments, they didn’t respect me enough to do so. I know this for sure because my husband spoke to them both, and mentioned that I have depression, and they both told him they didn’t know that. Not that that would have been a good excuse for their behaviour, but they would have known, had they read anything I had to say. I came home in a frenzy, the moment I walked into my apartment, I let it out, the crying, screaming, and yelling I was holding in all day. I told my husband that I never want to see either of them again and deleted them both from Facebook. Ironically, my husband had plans with Red that night, and I didn’t tell him not to go, it was a concert he was looking forward to. I didn’t tell him I was having active suicidal thoughts. I didn’t want to ruin his plans. I laid on my couch all night while he was away. I was afraid to be alone, but I didn’t want to tell anyone to come over because I didn’t want to tell anyone why. I was texting with my best friend (purple) and tried to hint at the fact that I was feeling suicidal, but I couldn’t bring myself to just say it. I had a few drinks to try and get my brain to stop over-thinking about that entire situation. In the days and weeks that followed, I was in a bad depression. At work, I had a hard time concentrating, but I just did my work until it was time to go home. I often listen to music at work, and instead of my usual pop stuff, I decided to listen to some old Linkin Park music. I almost wanted nostalgia for my angsty teen emotions. I spoke to a support group about everything that happened, and that was very helpful. 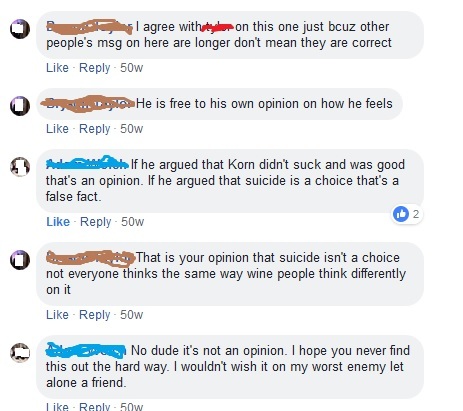 I recall one person saying that suicide is the opposite of cowardly. If you think about the number of times people change their mind last minute because they are scared. That resonated with me because I chickened out once. I made an appointment with my doctor and my medication dosage was increased. And I began my climb out of the depression hole. A couple of weeks ago, I started to reduce my medications back to what they were before this depressive episode. I have a better understanding of the reality of my condition, and I know that even if I haven’t had suicidal thoughts in a long time, it doesn’t mean I am out of the woods entirely. I have passive suicidal thoughts occasionally still, but I don’t worry about them too much, I just pay attention to my thoughts more and begin to do things to help keep me from going in the depression hole again. I haven’t spoken to Red since this incident. It’s hard to avoid Brown, he is my husband’s brother. I needed a lot of time at first, especially during the depression. I was adamant about not seeing him again, but ultimately I decided I would be civil with him for family gatherings. He messaged me with an apology when my husband told his Dad why I didn’t want to come up if he is there. It was sent within 20 minutes of my husband hanging up the phone with his dad. It was generic and he didn’t actually apologize for what was upsetting me. I don’t care about an apology, I just want him to care enough to read what I had to say. And even though I’ve been around him a few times since and I’ve always gotten along with his girlfriend, who I would hate to not see anymore, I’m still a little bothered by the lack of closure here. Basically, I still feel hurt, by both of them, and I don’t know if anything can possibly change that. Whenever I hear about Chester, or Linkin Park, this comment thread pops into my head. The hurt feelings and pain I felt that night I laid on the couch fighting off my demons come flooding back. But now, I feel that going through a depressive episode as bad as that one was has given me the strength and understanding to handle them going forward. So I am able to use my CBT techniques, and other strategies to cope when the pain comes back. I try to see Chester as a symbol of my ability to get through a bad depressive episode, but also a reminder that my depression recovery is something I have to work on every day.